The dangers of energy drinks are getting a lot of press these days because of the sheer volume of energy stimulating products on the market today and the ease of access to these by minors. While most energy drinks don’t have as much caffeine as your average cup of Joes, they are heavily sweetened and easy to drink, which appeals more to the younger population. In this article, we will explore the most common side effects of energy drinks. So think twice before drinking the following top 10 energy drinks with potentially dangerous side effects. Parents should also use caution before giving them to their kids. This energy drink is a proud sponsor of Olympic athletes. Euphoria, insomnia, anxiety and irritability are a few of the many symptoms you would feel after drinking this energy drink. It is also quite possible to crash and to experience seizures. Studies show that the drink contains high levels of caffeine and warned that teenagers risk dangerous, even life-threatening, effects on blood pressure, heart rate and brain functions. 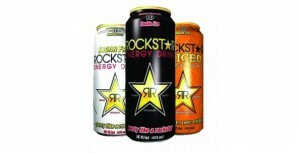 Rockstar is one of the top three energy drink brands in North America, having sold over 2 billion cans. It had 14% of the US energy drink market in 2008, and as of 2009 was sold in over 20 countries, in addition to the United States. The manufacturer switched distributors from Coca-Cola to PepsiCo in the summer of 2009. Its US products have two levels of Caffeine content – either 10 mgs of caffeine per ounce, or 15 mgs of caffeine per ounce. The original drink also contains 160 mgs of caffeine per 16 ounce can, while the Rockstar Punched energy drink contains 360 mgs of caffeine per 24 ounce can. Other than caffeine and sugar, Rockstar Energy Drink contains a variety of herbs, including panax ginseng, ginkgo biloba, milk thistle extract, and guarana seed. The amount of guarana used to be higher, but was lowered after customer criticism. It also includes 1000 mg of taurine. As with all energy drinks, Rockstar can cause jitteriness, anxiety, and high blood sugar levels. If mixed with alcohol it may also mask the level of alcohol intoxication. There were several alcoholic versions of this drink that were discontinued in 2007. The mixture of alcohol and energy drinks is lethal in this case. Their motto, “Want a sugar-free energy blast without the caffeine jitters?” But this drink is nowhere near safe to drink, in fact it is caustic. The person drinking it can experience bloating, diarrhea, heart burn, vomiting, nausea, sleep disturbances, and gastrointestinal problems to name a few. You may also find yourself sitting on the toilet for a long while. 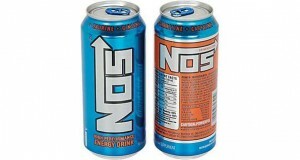 NOS is an energy drink that we caution you not to drink excessively. Those who have sensitivity to caffeine should not drink the energy drink. Furthermore, people should not drink this in the morning, before eating, and before exercising. It has 260 mg of caffeine. Also, mood swings are quite common when drinking it. 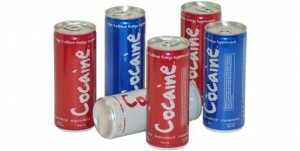 Parents should think twice before offering their children this energy drink to consume. The drink carries Niacin which is used to prevent and treat pellagra deficiency. The acid is known to be the leading cause of dementia, confusion, and severe liver problems, when drank in large quantities. If you are an endurance athlete, PowerAde can be beneficial. It can assist you with preventing hyponatremia. When you consume too much water, your sodium levels decrease — causing you to have headaches, swelling of the hands and feet, and sometimes vomiting and death as well. Because Powerade contain sodium as one of the electrolytes, consuming it during a physical activity can balance your sodium levels. The Alternative? Instead of getting a can of energy drink which costs around $5, how about making your own, much healthier version energy drink using natural sweetener and honey? There are plenty of recipes on the internet, but the most important ingredients are honey, lemon juice, sea salt and water. You can alter things around based on your tastes and preferences. Monster is a popular citrus energy drink. Despite its success, there are various side effects which could lead to gastrointestinal problems because of the high levels of carbohydrates. 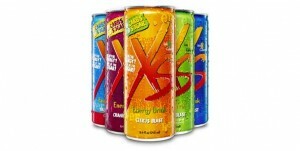 Those who consumed the energy drink reported stomach aches, vomiting, headaches, and blurred vision. 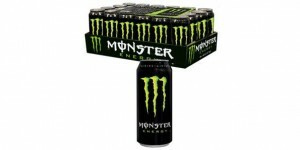 The Monster Energy drink purportedly contains 240 mg of caffeine, similar to seven cups of coffee. It also contains other stimul/ants, including guarana, a natural caffeine-containing plant panax ginseng and taurine. In October 2012, a Consumer Reports investigation found that 27 of the most popular brands of energy drinks in the US contained a different amount of caffeine than was on the label, or failed to specify the caffeine levels.Monster was sued for allegedly marketing its highly caffeinated Monster Energy Drink to teenagers and young adults. A lawsuit filed by San Francisco city attorney Dennis Herrera claimed that the Monster caffeine levels can lead to elevated blood pressure, seizures and cardiac arrest, which is true. In October 2012, the parents of 14-year-old Anais Fournier sued Monster after their daughter went into cardiac arrest and died. The cause of death was determined – drinking two 24-ounce cans of Monster Energy drink in less than 24 hours. Red Bull has an increasing amount of sugar in its drinks. One can has 27 grams of sugar in it. Those who drinks the energy drink daily may experience a weight gain. Weight gain of course could lead to high cholesterol levels and other gastrointestinal problems. Additionally, there can be a risk to your cardiovascular system. You may experience high blood pressures as a result. The 5-Hour Energy drink is claiming that what makes them stand out from others is that its drinks come without the “crash” most energy drinks are known for. The daily value percentages on the supplement label divulges some shocking percentages like Vitamin B’s. The recommended daily dose for B3 is 14mg, 1.2 for B6, and 2mcg for B12. The amount of B3 in a 5 Hour Energy drink is 30mg, 40mg of B6, and 500mcg of B12. Overdosing on Vitamin B when the drink is digested over a long period of time can lead to headache, dizziness, fainting, yellowing of skin, and even nerve/brain damage that lasts 3 months to 3 years. 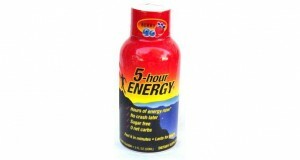 In December of 2013, Oregon filed multiple false advertisement lawsuits against the 5 Hour Energy manufacturer. The state begs to differ with the manufacturers’ definition of “no crash,” as well its claims that it is safe for consumption. 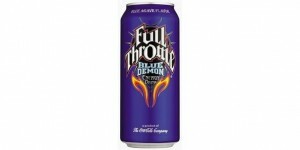 The drink has 280 mg of caffeine, more than any other energy drink. Insomnia, headaches, vomiting and dehydration are some dangerous side effects. The worst part is that the company appeals to kids to drink it. Kids and adults alike love to drink Gatorade at least twice a day. They drink it for lunch and sometimes in between meals. Gatorade is refreshed with different vitamins and minerals, including fat-soluble vitamins. Fat-soluble vitamins cannot be released from the body when they are consumed in larger than normal quantities. The side effect is called vitamin toxicity (hypervitaminosis A). This happens because Gatorade is extremely high in sodium (to help keep you hydrated) and also very high in sugars (for better tasting). Excessive sugar in your diet can be very bad for your health, and it is important to limit the amount of added sugar you intake. Sugar that is naturally occurring in fruit and milk is healthy; it is the added sugars that creates problems. The G2 line of Gatorade has fewer calories and less sugar; but it does have sugar alcohols instead. Sugar alcohols are a type of reduced-­‐calorie sweetener that provides fewer calories than your typical sugar. They do increase blood sugar levels, but less so than regular sugar. On a positive note, they do not cause tooth decay. Sugar alcohols can have some negative GI side effects, such as bloating and diarrhea. Another issue with Gatorade is the amount of food additives and colorings they add to the products. For example, one additive is monopotassium phosphate, which is not only used as a food additive, but also as a fertilizer and fungicide. It is a quite scary to be digesting an ingredient used for fertilizing plants. Additionally some flavors of Gatorade contain brominated vegetable oil (BVO), a food additive used as an emulsifier in drinks with citrus flavoring. Bromine is an element found in flame retardants! Some studies show that it may build up in the body and lead to thyroid problems, memory loss, and skin and nerve problems. In January of 2013, PepsiCo Inc. removed a controversial ingredient (brominated vegetable oil) from its Gatorade sports drink in response to customer criticisms. The petition on Change.org argued that brominated vegetable oil has been patented as a flame retardant and is banned in Japan and the European Union, and therefore should be banned altogether from the energy drink. It got the support of more than 200,000 people. PowerAde still has the ingredient in their mixture. © 2019 Rich Top 10 Lists. All rights reserved.